Peel and cube the butternut squash. Coarsely chop the onion. Peel and smash the garlic clove. Chop the carrot into 1/2 inch chunks. In a large stock pot, add all of the vegetables and the vegetable stock. Bring to a boil, cover, lower the temperature and simmer until the squash is soft -- 20-25 minutes. Drain the vegetables in a colander (save the liquid for soup). In 3-5 batches, put a portion of the vegetables into a food processor and drizzle in 1-2 tablespoons of olive oil. Process until it is very smooth. Transfer the butternut squash butter to a large bowl. Repeat this process (using the rest of the olive oil). Stir in the salt and adjust to taste. For a low-fat version replace the olive oil with vegetable stock. 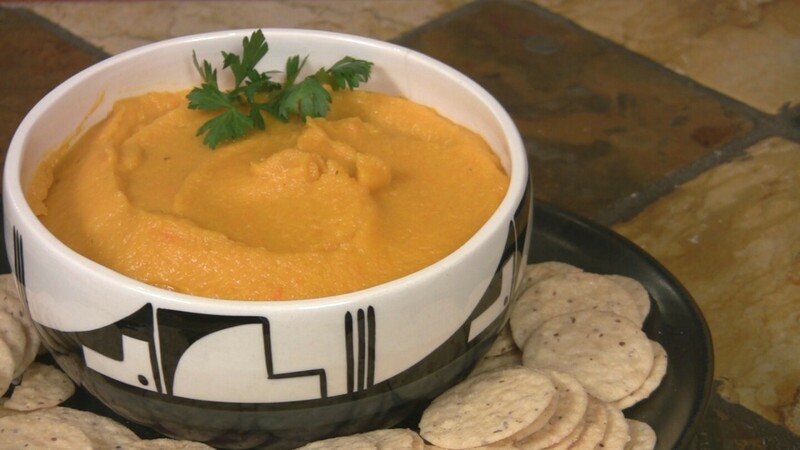 Serve warm or cold with vegetables for dipping or on whole grain bread, crackers, or rice cakes.